Second show in Horsens tonight, another capacity crowd and this European leg is hitting its stride. A great atmosphere with the Danish audience and signs that the band are thinking about some more surprises in the set list. And on my right, the Heidi Klum of our catwalk, The Edge. 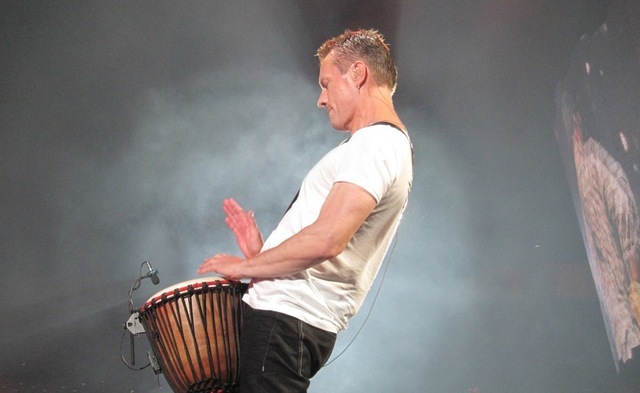 And behind me, on the drums, our very own model/actor, Brigitte Neilsen - Larry Mullen Jnr. 'Baby, baby, baby, light my way. We'll leave those of you who were at the show to tell us what you thought were the highlights - but we already know that the return of Ultraviolet was one of them. Were you there tonight ? Write us your own review and add your photos. If you weren't there, check out the full set list and see what everybody is saying about the fifth show of the 2010 European leg of the tour. I think, monday was i little better than sunday. Maybe because the sound was better, and I heard Bono's voice better. There are so many songs, I would like to hear, but it would give a 12 hour concert - or even more. As long as You just give us a great show - like both i Horsens and Gothenburg last year, I'm happy. Thanks for great concerts, and thanks for Snow Patrol, they are the best warm up, i have ever seen. It's incredibile: Fez is the perfecto intro and Cedars the perfect end of the Show!! i love u2 and i love to have ultraviolet back in the setlist... for the next shows i would love to get some more surprises in the set. i was in frankfurt and hannover aswell and i will be in munich zurich and vienna too. would be great to get some other songs during the leg. i would love to hear unknown caller again, no line on the horizon is for me a perfekt live song for singing along. kite, stuck and bad would feel great instead of in a little while and miss sarajevo. maybe the band can give us some surprises during the next shows. i will love it!!! Great show! Thanks. The highlights were "I Still...", "One" and "Utraviolet". I would have liked to hear "Until the End of the World" and "Running to Stand Still", though. I liked the part with Amnesty International. It was classy and not over the top. U2, you are the best. Great to see Ultraviolet back on the setlist! What about Breathe though???? Let Stingray Guitar step back a few songs in the setlist. Breathe is the opener of all openers. Pleeeeease open w/ it again! Bono finally sang Ultraviolet with his heart. We need some other great songs added to the setlist like Drowning man (this could be a gem), Exit, imagine Who´s Gonna Ride your Wild Horses in the electric version, Trying to Throw your Arms Around the World is a much better song than I am a Little While o Miss Sarajevo, or also playing So Cruel. By the way, Your Blue Room sounds fantastic live! I think Miracle Drug is also extraordinary live. Keep doing a good job, all these songs would be great to hear them! What a brilliant evening sunday the 15. august at Casa Arena. The best band in the world. And remember how lucky we are... A band with so many magnificent songs. A band, that can choose so wonderfull tracks. And we discuss what they should have chosen. But all are just brilliant tracks... But one of them is outstanding: Until the end of the world. Best track and an exceptionally guitar solo by The Edge. Great to see "Ultra Violet" Back again. heard "Hold Me Thrill Me Kiss Kill Me" On Youtube really great. & nice suprise. But "Unforgettable Fire" Will be missed. Love "Return Of The Stingray Guitar". Still miss "Breathe". Glastonbury sounds great too. Just...please...put back Until and TUF....please! I LOVED HANNOVER U2! Thanks also for bringing back Ultraviolet back, I wasn't there in Denmark to hear it, but in comparison to the 2009 European shows I like UV better ; ) Please don't drop Unforgettable Fire - please please? And I know it may be a tall order But I realy would like to see some variety in the set list - " you know I love the element of surprise...." It's so much fun when you break out the older ones too when no one expects it! Like Gloria and Electrical Storm!!!! Thanks for all the news songs, keep 'em coming! I think it's great that the band added Ultra Violet back in (it's just such a hit! ), but most of the songs are music we've been hearing for the entire 2009-2010 tour. The boys should bring back more songs like Drowning Man, Mofo, Discotheque, Zooropa, and, well, you get the picture. Basically songs they haven't played for a long time, but would work great with the show. Also LOVE the addition of Hold Me, Thrill Me, Kiss Me, Kill Me! This was the best concert in my life. I have never been a great U2 fan but now I understand what Bono and U2 are doing. It´s not only a concert. It is human and nearly religious. Everybody was having great fun and it did´t matter where in Stadion. 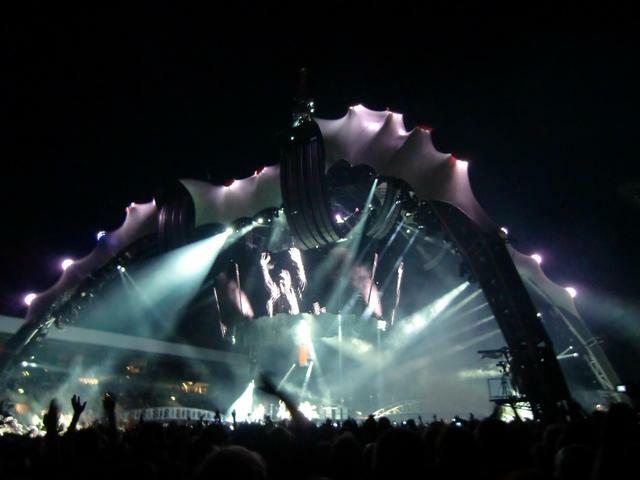 Everybody go intim contact with this huge scene and the group U2.....amazing. A marvelous night for us all at Horsens yesterday. Me and my 7 friends came all the way from Sweden :-) and no one was disappointed. My second 360-stop. Somethings better, some not. The sound was not the best in the pit yesterday!! The band more tight than ever - fantastic. Would be happy if you coul´d go outside the planned box some more... Loved Glastonbury, Hold me kiss me..., Elevation and as always Moment of surrender. Such a great mix of songs (but it would be cool with some more surpise in the set-list). Missed some more talking from Bono...love your passion for changing the world, don´t compromise on that!!! That is one of the reason that makes you so great. God bless you and thanks for being Gods voice to our souls! One more 360 to go for me, in Athens in some weeks. See you then! I feel truly blessed everytime I attend a U2 show. This was my 9th overall, and my 4th 360 show. When you attend a U2 show, you are truly in the presence of greatness, and I cannot think of any band that comes even close to delivering on such a high level everytime! Horsens 1 and 2 were no exceptions. Very energetic, the band looked relaxed and loose and the performance was solid. My highlight was Until the End of the World on the first night. 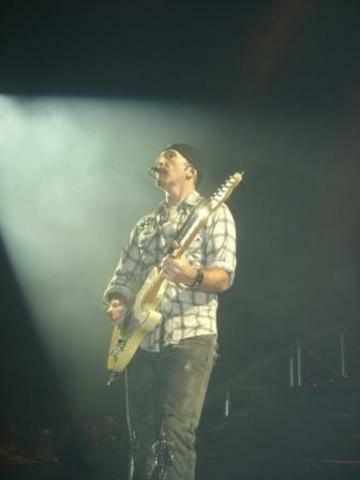 Love the energy of that song, and the full use of the stage lights when Edge punished his guitar. Awesome! So obvious that he enjoys playing that song. Too bad they dropped it on the second night. THANK YOU FOR BEING U2 AND FOR BEING IN MY LIFE! was in Frankfut a week ago, was my 5th 360 gig and UV was the MOST MISSED from last year tour, being a fan for 20years and agree with Francesco bellow that 360 tour has been build on "No Line" "Magnificent" magic triple combination of "Unknown caller"+"Unforgetable fire"+"Citi" and probably most impressive live song from U2 I have ever seen - the UV return in 2009. "Until the end" was a sweet cherry. What about "Fez" as an opener instead of "BD"? too cheeky? Anyway every show is a breath taker, For me You will stay the Best Band Ever :-) Thank You Guys! CU in Vienna! Just returned to Copenhagen this morning after 2 amazing concerts in Horsens - you are without a doubt the best live band EVER, and with the number of songs to choose from it is impossible to please all! I personally loved "Hold me, thrill me..." it is a great song for a live performance, but can also feel a strong love for "Glastonbury" growing inside me. See you again on 18th of Sept in Paris where i will turn 30 with the 4 best lads in the world (please play Sweetest Thing for just one night).